[Ed] needed a bunch of edge connectors for video game cartridges. He was unable to source parts for Neo Geo Pocket games and ended up building his own from PCI sockets. But it sounds like this technique would work with other console cartridges as well. 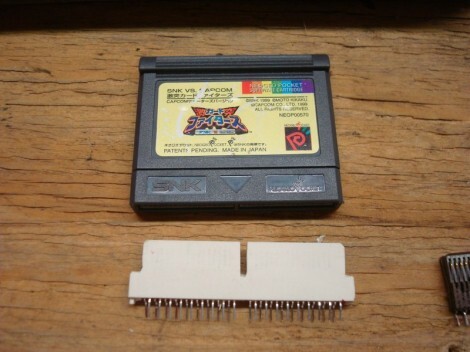 From the picture you can see that this is a bit more involved than just slapping a cartridge into a socket. Because there are multiple steps, and many connectors were needed, [Ed’s] dad lent a hand and built a few jigs to help with the cutting. The first step was to cut off the key and the narrow end of the socket. These NGP cartridges are one-sided, so the socket was cut in half using a board with a dado cut in it as a jig. From there the plastic bits can be cleaned up before pulling out two center pins and cutting a groove to receive the cartridge key. There are also two shoulder cuts that need to be made after trimming the piece to length. The video after the break will walk you through this whole process. These PCI sockets are versatile. One of our other favorite hacks used them to make SOIC programming clips.